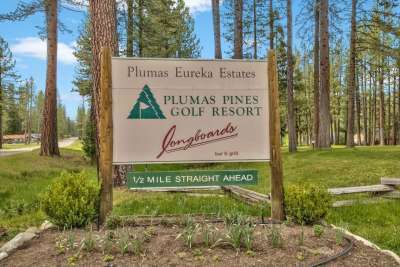 Plumas Pines (sometimes referred to Plumas Eureka Estates) is a well-established master-planned community, consisting of homesites (lots), single-family custom homes, and multi-family condominiums (Villas). Add to that the 18-hole Golf Course, PLUMAS PINES GOLF RESORT, and the very-popular LONGBOARD’S Bar and Grill. Within the Plumas Pines neighborhood are the Eureka Springs Subdivision and The Villages. Most all properties are served water and sewer by the Plumas Eureka Community Services District, however, not ALL. Check with your Realtor to determine, as many properties may have an independent septic/leachfield system. The Pool and Tennis Courts are located off of Cottonwood Drive and are available for use by either purchased membership or a daily fee.